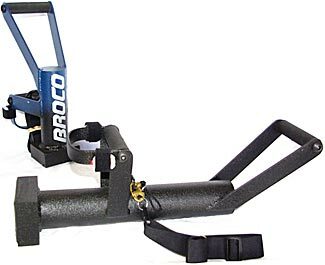 Broco ENFORCER™ series one-man door rams are engineered for rapid forced entry by tactical teams and first responders. ENFORCER™ rams feature unique design ergonomics to maximize striking impact while maintaining a neutral wrist position throughout the arc of the Breacher's swing. Enforcer rams can be thrown overhand, underhand or from the side using a natural motion that derives energy from the hips and shoulders as well as the arms. Users find it's like swinging a baseball bat or throwing a punch. Broco® ENFORCER™ Door Rams feature: Weight forward design is thrown in front of the Breacher to maximize impact from hips and shoulders. Hits like larger traditional rams. Reach-through handle for easy one arm carry. Keeps the Breacher's weapon hand free. 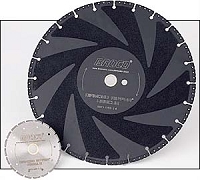 Chrome carbide hardfaced impact edge prevents wear. Fixed rear handle prevents rear wrist from rolling upon impact. Rotating front handle maintains proper front wrist alignment throughout arc of the swing. Knurled rubber non-slip grips. Balanced sling point. Sling has quick release snap shackle. Comfortable shoulder carry. Welded 1" steel knuckle guard protects hand from door jambs. The Broco ENFORCER™ breaches most residential doors within one to two seconds, and forces open doors with as many as seven different bolts, locking systems, and chains. 24" length 38 lbs. The BABY ENFORCER™ is a compact version of the ENFORCER™ door ram designed for operations with space and weight constraints. It is easy to conceal and easy to carry, and its high mass provides effective operations in tight, difficult breaching conditions. Ideal for plainclothes work including Narcotics, Gangs, and Vice. 16" length 25 lbs.